The final mile delivery when it comes to end consumer delivery is really supplying that end consumer with the experience that they're looking for. We are implementing a Web Application which will be able to compute an optimal route for delivery points. Recalculations of the routes are possible in case any unexpected events may occur. We target the all companies that have as business subject the delivery of products, such as FanCurier, UrgentCargus, SameDay, etc. Our competition is represented globally by UPS, DHL, Routific, etc. and regional (which is our main business launch area) FanCurier and UrgentCarus which have some in-house solutions for route optimization. As well, there are other companies that offer the same things as we do, but we have an advantage over them. Our main advantage is that we gathered lots of ideas from multiple systems and merged them alltogether in one system. Allowing users to customize their routes even more. We're basically an UPS & DHL delivery system on steroids! As well, we offer a collection of endpoints where each delivery company can make requests in order to calculate optimal routes for their delivery cars. We have noticed the issue based on our experience with current delivery methods. Whenever we ordered something online and we chose to have the order delivered to us, we did not have the option to choose the time of delivery, therefore we were not at home to receive the package. This represents a disadvantage for both the clients and the couriers. Our solution receives a number of delivery points and a number of couriers for input, and it outputs an optimal route for all the couriers. It is also able to adjust the routes when the input changes in real time. The algorithm is very efficient, as it approximates the optimal solution with a speed several orders of magnitude faster than the most efficient algorithm to find the optimal solution (due to the fact that the TSP problem is NP-hard). Routify.IT is a solution for all delivery companies. 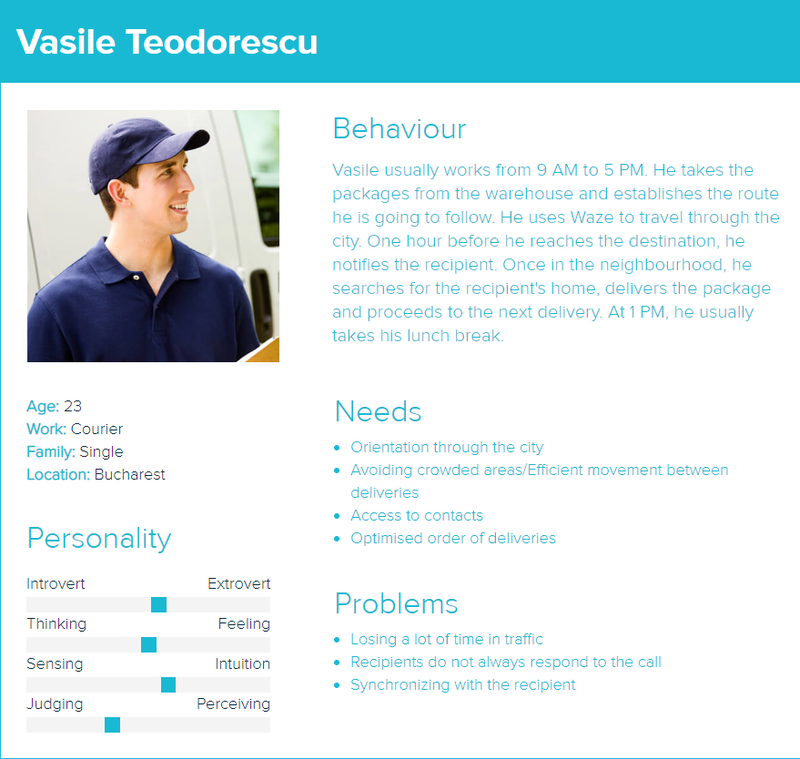 At the beginning, we chose to focus on delivery companies which run in Bucharest. We have a few connections with some of them and we managed to discuss face-to-face about how helpful our solution would be. Some of the companies we have discussed with include PostaPanduri, UrgentCargus and Bookurier. What are the main problems with the delivery system? How do they handle the last mile delivery problem? How does the last mile delivery problem affect the business? What are the expectations from a possible solution? How would they evaluate the solution? What other offers did they receive and if they would choose our solution over them? The last mile delivery problem is not only a local problem, but a global one which affects even foreign delivery companies, because the TSP problem is not tractable for large amounts of data and it would take a lot of computation to adjust to realtime modifications. The discussions with Bookurier, UrgentCargus and PostaPanduri helped us decide on the price of 50 bani / address. This price assures that our product will not substantially increase the delivery fees when our service is used. The second thing we found out during our discussion was that the companies were much more inclined to pay our service per address point and not per delivery package. We believe we will find out more about what adjustments we can make to the solution once they will try our product during one month. We are getting ready to test our product as soon as possible. We already made deals with PostaPanduri and with Bookurier to test our product once it is in a working state. In this section we will explain the structure of the interface throurgh which the user can control our application / website. Our initial mock-up features a menu on the left that controls the user actions and on the right side (90% of the view), we can see a map view that will be updated based on the user inputs. 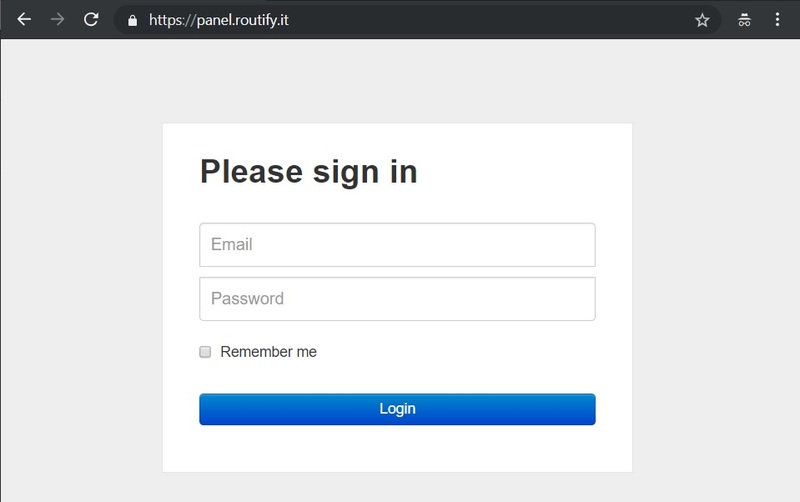 When a user will access the Routify Panel he will be asked to provide his account (composed by an e-mail account and a password) in order to login in the Routify.IT Panel. This login screen can be seen in the image on the right. After a succesful login, the logged user will see the screen showcased on the left. 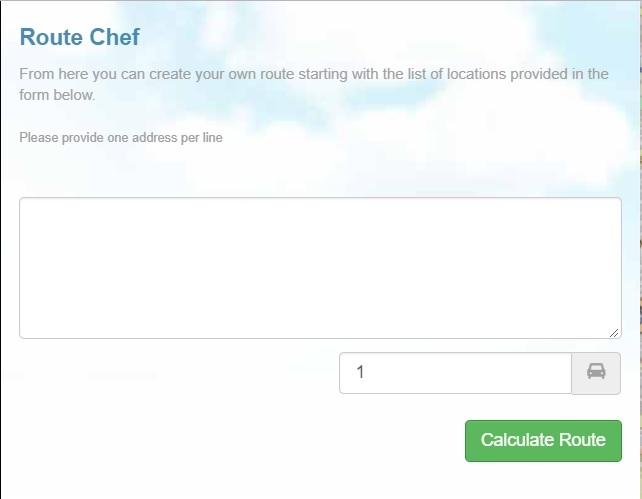 Using the chef hat in the upper left corner the user can hide Route Chef section in order to view the map on almost all the screen. Using the gear wheel icon the user can go to the Admin Settings Page where he can set different informations about his/her account or parameters which are used in route computation. In the left side of screen the Route Chef section is present. As shown on the right, it contains a description and a text box where the user must provide addresses for his route one per line, an input where the user specify the number of vehicles in the fleet. After the user has finished filling out the form he will have to hit the 'Compute' button so the system can calculate the optimal route for his input. After providing the address and hitting the Compute button, on the map the optimal route will be drawn with pins indicating the addresses that must be visited. 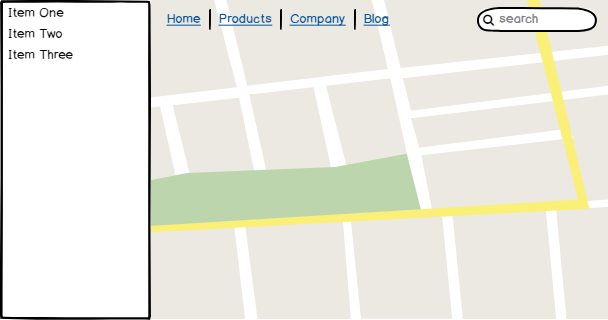 At the same time, the Route Chef section will be closed in order to enlarge the map view. Also, as it can be observed in the upper right corner a section will appear in which route driving instructions are present. Users have also the ability to move the pins around and the route and driving instructions will be compute in real-time. How did or would you improve your delivery times? What is the normal delivery rate for your business? What is the delivery rate for a package in the first try? 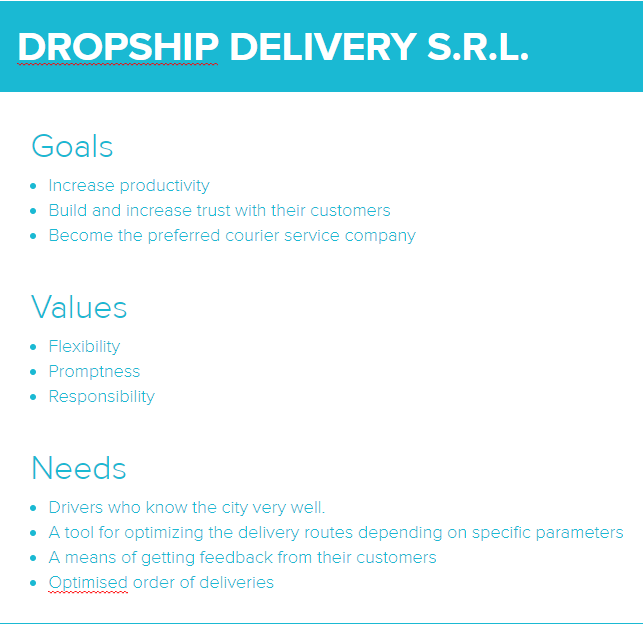 What do you think would best suit your business in order to obtain a better delivery rate? Do you think that 0.50 RON per address is a lot for an algorithm that optimizes your route? We have shown them the interface and asked what they think about it. We would like to have an automate solution that will take care of them and at the same time to be easily integrated with my current software. We are a small company so we deliver weekly to about 200-300 locations. December is the season in we reach a thousand deliveries per week. As we are new on the market, we can't give out a good estimate, but let's say we miss about 20% of the deliveries and we have to reschedule them for another date (or address). We need a method to agree with the client on a common time frame, something like 20 - 40 minutes time window, in which the courier can come by to deliver the package and gurantee that no return to depot will take place. 0.50 RON per address is a big sum for a small bussiness, but if the system does what it's promises (saving fuel & time) we might afford it. We'll be glad to take part in your pilot program! 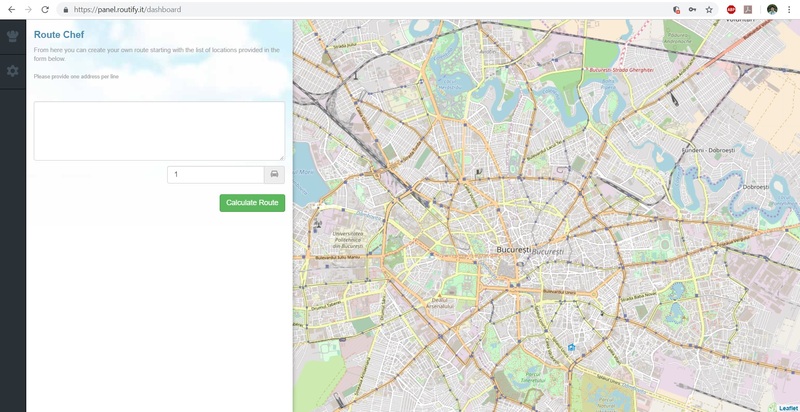 An easy to use interface for persons which are familiar with Google Maps. Plain and simple, it does what it’s purpose is. We hired two people to take care of how fleet vehicles routes would cover the whole metropolitan area in an efficent manner. It kinda works, but it is painful because it’s time consuming and stressful to manage routes everyday just by looking on a list of delivery locations and making computations in a Excel spreadsheet. We deliver to about 400 packages per day and in busy seasons like Easter, Black Friday and Christmas we are shipping about 800 per day. In the delivery days's morning we inform our clients that the courier will go to their location to ship them the package. We specify them that the shipping moment is in the working hours (9-17) which is too general in order to sync better with them. We need a more precise time frame, something like half a hour time interval in order to lower the returning parcels number. That's a great price! Right now we have two people that are taking care of that and they cost us more money. Having more vans is the current answer because we deliver a lot of packages daily. Also, a big problem for us is that we must hire new drivers. We would try optimizing the routes that our vehicles follow but right now we don't have an IT departament to do this kind of stuff. We are among the biggest players in Romania. We deliver about 10.000 parcels everyday, as for the special seasons we can't release those numbers to the public yet. We have a score of 70% of delivering the package from the first try. Having such a market share implies also to have misses with delivering parcels and having them return to the sender. We need a system that gives us the opportunity to sync with the client before the delivery car leaves the depot. That would allow to set a specific route for each car everyday, maybe a more efficient and less chaotic one with less unforeseen events. Asking for an extra sum of money to calculate a route adds up to the total delivery price paid by the end customer, if the price accepts it, we're up for it! It’s a good interface but we would like to have an option to import/export routes from/to different formats in order to store or share them. We have two User Persona's that we currently target - the company & the courier. After taking the face-to-face interviews and deciding on a template that we should use we updated the wireframe to reflect our findings. Below you can see the user flow that is present in our application. We are collecting contact data from potential customers, to this date (13 JAN 2019) we collected around 132 email addresses. As well, when we add the entries into our database we also store the external ref (the website from which the user came from). Right now, we have 88 users reffered by hacker news (ycombinator). Adding Google analytics on our landing page. Because we wanted to see how many people we can reach (online at the same time) on our website, we added Google Analytics before bringing people to our landing page. What we want in the page is clicking the 'subscribe' button. So our conversion rate is number_of_users_who_clicked / number_of_users. Right now, our conversion rate is at 12%, which is a very good number giving the circumstances (B2B oriented). As well, we added HotJar on our landing page so we can track our users activities. In the begining, in our first landing page version they were losing interest by the time they reached the subscribe area, so we moved that area a bit more up. We can't say for sure how much that affected our conversion rate, but probably for the best. As our old fiki wasn't detailed enough, I would like to add that we are B2B oriented, so normal marketing means (for ex: Facebook) don't give us a lot of traffic. We started this project with one client already hyped up to try our solution. During our mid-term presentation we presented our bussiness ideea (inspire a need in our local market - Romania for a product like ours). Nevertheless, to complete our milestone we added some links (Facebook, HackerNews, Reddit). We determine that our markets have a few dozens of possible customers because they are the parcel delivering companies. In the regional market (Romania) we have almost no competition because delivery companies use old methods to make their routes. Only some big-players have a sync with the client on their delivery schedule. The solution - we offer, for a small price all the solutions that other companies have, combined. That means our clients can choose what suits them best, or switch to another algorithm if they don't like it. Right now, we have two main competitors on the regional market (UrgentCargus and FAN Courier). Our main advantage over our competition is that they use an in-house algorithm that barely optimizes the routes that they take in order to serve their client needs. We believe that the solutions they are using right now is our main competition because they can, at any time, to sell their solution to other companies. Their market share in Romania is about 32% of the market and FAN Courier's share in Romania is presumably way bigger than UrgentCargus (no official records found). We forsee that will be able to convert easily the small players of the market in around 6 months. This will give them an edge in order to expand their business over bigger players. When this will happen bigger players will want the solution if they didn’t already integrated it. We expect an 80% conversion of the market in the first 4 years and a close to 95% after 5 years. The total market value could be calculated as the number of packages delivered per day. As we could not find any official data (besides UPS'es) we estimate that Romania's number of packages delivered per day is about 35.000 - 50.000. If we would convert those numbers, estimate a 0.50 RON per delivery, we can assume that the total market value is between 17500 - 25000 RON per day / 6387500 - 9125000 RON per year. Our estimated market share in years 1-5 is estimated at the 'Potential Market Share' point above. From the aspects discussed above we can conclude that our business has a good profitability with almost non-existent or weak competition in the regional market (country). 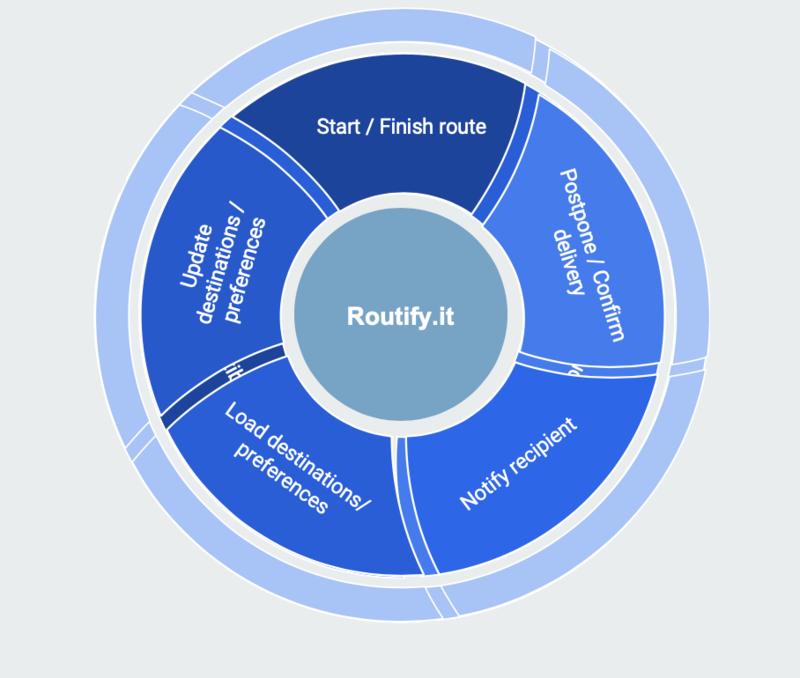 Routify's purpose is to make route improvements for delivery companies in order to save time and fuel, both very important resources in the shipping sector. It helps companies to plan routes daily by getting a list of locations that must be visited and the number of available vans (or couriers if you preffer to refer to them as humans) as input. It runs a custom algorithm designed specifically in order to split the locations to vans in a way that the sum of whole resources used to complete the deliveries is split equally among all available vans. We observed that a natural simplified version of our product would consist of an algorithm that is able to provide an almost optimal tour that goes through all the locations but does not offer extra customizable options (for ex: number of vans, delivery times for each location, etc.). The first phase of development is to implement an advanced version for the algorithm that makes a simple route for all locations in which only one van is used. The second phase in our vision is to create a close to optimal spliting-and-routes-making algorithm in order to split locations in number of vans groups that have the sum of resources need for traveling as minimum as possible. The third phase we will use as many implementation details to adapt the algorithm to a tailored web servers arhitecture in order to make the solution to support as many locations as possible. Also, it is important to add the possbility to specify a time frame for each location when it must be visited. This phase is important in order to compute routes for large fleets of vans in large cities where there will be lots of stops that will have certain restrictions as business hours in case of shops or to not mess the schedule of some busy persons. Our first sale, or better said, our first demo was and still is used to this day by Posta Panduri. In our vision, when we refer to a first sale, we refer to the moment our product is potent enough to make a sole stand in the Romanian market. After we have achieved, in the next few weeks, such a position, we will start talking to even bigger companies such as FAN Courier. A potentially second “paying” client that is currently showing interest in our solution is Bookurier. We have talked to them and they said that our solution will integrate naturally in their business and that they are convinved that it will lead to an improvement in their overall profits. Right now we are running a minimum viable product, a product that will grow into something bigger in the following weeks to come using the feedback that both PostaPanduri and Bookurier will offer in return for their demo. On demand we can show PostaPanduri's routes on our website, but unfortunately we cannot publish them here. We updated 'Milestone 3' to reflect the changes in our product. As well, you can try out our product here. As credentials please use the email demo@demo.com with password demo1234 . The demo is limited to max 1 vehicle - for computation issues, if you want more you can always register for a free, one month, trial. You can view our old fiki here but we encourage you not to since it looks bad.